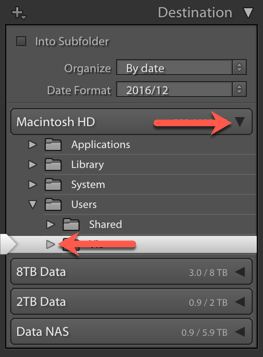 Lightroom Classic Tutorials > Organizing Photos > Folders on the Hard Drive > Where should you store your photos? In an earlier post, we said that Lightroom doesn’t hide your photos away from you. They’re kept as normal image files in folders on your hard drive. The benefit? You have complete control over where they’re stored, you’re not locked in to using Lightroom forever, and you can access the photos using other software. The downside? That makes you responsible. You need to know where they’re stored, how to back them up, and you need to understand how what you do in Lightroom affects these files on the hard drive. When you import your photos, YOU make the decision on where to store the photos (even if that decision is to accept Lightroom’s defaults). It’s possibly the most important decision you’ll make in Lightroom, so it’s worth taking the time to pay attention to the choice you make. At the top of the dialog, you’re given three main choices: will you copy the photos to a new location, move them to a new location or just add links to the catalog, leaving the image files where they are. Stop and think about these options for a moment, because your choice will depend on whether you’re copying new photos from a memory card or adding existing photos. If your photos are currently on a memory card, and you tell Lightroom to “add” them at their existing location, Lightroom will record their location as being on the memory card. What will happen when you eject the card? Lightroom will look for the memory card but won’t be able to find them any more, so you won’t be able to edit and export them. And when you format that memory card? Gone forever. 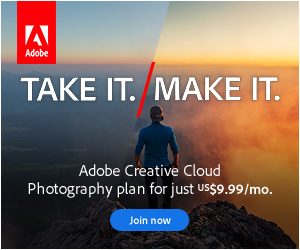 There won’t be a copy on your computer’s hard drive, because you didn’t tell Lightroom to copy them. So when you’re importing photos from a memory card, it’s ESSENTIAL that you select Copy at the top of the Import dialog. If your photos are beautifully organized into an existing folder structure, you’ll want to select Add. This simply adds the information describing the photos to Lightroom’s catalog, but the photos remain in their current location. Remember, though, if you then rename, move or delete the photos outside of Lightroom, Lightroom will no longer be able to find them. If your photos aren’t quite so organized – or if they’re spread haphazardly across your computer’s hard drives – then you might want to consolidate them in a single location. While importing, Lightroom can copy them to a new location, leaving the originals scattered across your computer (and therefore taking up twice the hard drive space), or it can move them to a new location. Whether you’re copying or moving photos, you pick the location in the Destination panel. Where will you store your photos? In order to pick a location in the Destination panel, you have to make a decision… where will you store your photos? The default location is the Pictures folder in your user account. This is a perfectly good location, as long as you don’t have too many photos and you have a big hard drive. But what if your hard drive is too small? Lightroom doesn’t mind where you choose to store the photos. They can be on an internal drive, an external drive, a network drive, or even a mix of different drives. The important detail is that YOU know where they are. You can make life easier for yourself by keeping your folders of photos under a single parent folder (or one for each drive), rather than scattering them in random locations. Why? If the folders of photos are stored in folder called “Lightroom Photos” or another easily identifiable name, it reminds you not to rename, move or delete these photos. If you need to move them to another drive or another computer, it’s far easier to copy/move a single folder with its subfolders than it is to hunt around 300 different folders on your computer. If the drive letter changes, it’s easier to relink a single parent folder than a large number of folders. It’s easier to back them up when they’re all stored under a single parent folder. As your collection of photos grows, you may need to expand onto additional hard drives, which isn’t a problem for Lightroom. In the Destination panel, you’ll see a volume bar for each drive that’s attached to your computer. When you click on the bar, the drive opens to show the enclosed folders. To see hidden subfolders, click the small triangles. The Pictures folder is selected by default. On most computers, this is on the C drive (Windows) or Macintosh HD drive (Mac). But what if you want another location? 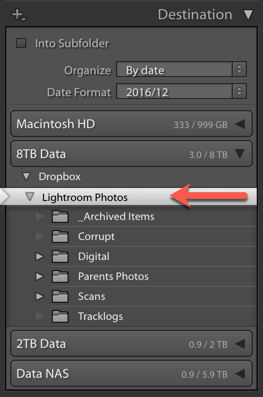 Let’s imagine you want to put your photos inside a Lightroom Photos folder inside your Pictures folder. It’s possible to create folders from within the Import dialog, but for simplicity, use Windows Explorer (Windows) / Finder (Mac) to create the Lightroom Photos folder in the Pictures folder. Now open the Import dialog and we’ll navigate to that Lightroom Photos folder. If the triangle next to the Pictures folder is pointing to the right, so the subfolders are hidden, click on the triangle. Now click on the Lightroom Photos folder so it’s highlighted in white. But what if you want to put your photos inside a Lightroom Photos folder on another drive? The same principles apply. Create the folder, then navigate to it in the Destination panel. The external drive might be collapsed, so you may need to click on the drive to show the contents. Again, click on the Lightroom Photos folder so it’s highlighted in white. The folder you select doesn’t have to be called Lightroom Photos, but you do need to check the correct folder is selected every time you import, so giving it a name you’ll recognize at a glance will help. 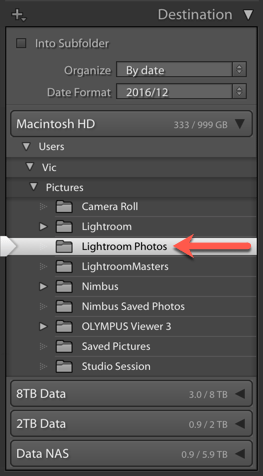 Lightroom will place the photos inside the highlighted folder. The Destination panel may be set to automatically create subfolders, which show in italic. We’ll come back to this level of organization in a few weeks time, after we’ve discussed how to organize the photos into subfolders, but if you want a head start (and even more detail), see pages 43-49 in my Lightroom CC/6 book. How do you find existing photos? Learning how to import correctly is great for new photos, but what about all of the photos you’ve already imported? How do you know where they’re stored on the hard drive? Simply right-click on a photo or on a folder, and select Show in Explorer (Windows) / Show in Finder (Mac). Lightroom opens an Explorer/Finder window directly to the location of the photo. You can go a step further, and make the Folders panel reflect the folder hierarchy on your hard drive, using the Show Parent Folder command. I’ve previously written about displaying your folder hierarchy here. If your photos and folders are in a mess, don’t worry. We’ll tidy up existing photos later in the series. First, though, we’ll discuss the best ways of organizing your photos into subfolders in the next post. Saving your photos on a single drive isn’t the best idea. If a power failure occurs during a write to that drive you may lose your data (photos) during the write. Storing your photos on different drives may save your photos in case of a power interruption but even that isn’t a safe way to store your photos. I would recommend RAID 1 (mirror) drive configuration to save your important photos on. This takes an extra drive but at least there is a recovery other than using recovery software. A good Network Attach Storage (NAS) system is also a method that may save your important photos. You may not have the connections on you computer motherboard to accommodate an additional drive. There are a number of recovery software out there and I for one use O&O Recovery. It is a slow means of recovering your photos but it’s better than a complete lost. RAID1 is good IN ADDITION to another backup system. I hear of far more files getting deleted through user error than drive failure, and that would be instantly replicated to the second drive. If possible use RAID 5 instead of 1. You will need a minimum of 3 drives to use RAID 5. The advantage I see is drive space. You’re supposed to have a UPS on your machine and on any network device. A power failure should not be an option. That goes without saying. RAID is in no way a substitute for backup. After that, follow the golden rule of backup! … you cannot go wrong. I have stored my photos on another drive and Lightroom keeps on losing them. It changes the name of the drive from “hard drive” to “hard drive 1” . I am constantly having to get Lightroom to re-synch the folders. Yeah, that’s not Lightroom, that’s your operating system changing the mount point. You’re on a Mac? Why it’s doing it is a good question though. I’ve seen it in the past with my NAS, and fixing it involved deleting a ghost out of the volumes folder, if I remember rightly. That’s probably best handled by an Apple genius if you’re not too geeky though, or google it. There is a possibility that another drive in the system has that name. A good indication is that “1” after the drive name. Strange. The only way that could happen if both hard drives have the same ID or name. If you’re using a MAC I’m not familiar with their file naming convention, however, if you did that on a PC running Windows, MACintosh hd vs Macintosh HD is seen as the same filename, macintosh hd. Windows will give the option to replace that file, rename it or delete it. BTW if you keep that file Windows will rename it macintosh hd (1). Ah, ok, that’s because Lightroom is case sensitive but the OS isn’t. It’s fixable. Probably easiest to do on the forum where we can talk you through properly. Post it on the forum and I’ll look out for your thread. Great article, Victoria. I have long felt this issue was overlooked. Not only where to put files and folders and the structure, but also the differences between folders and collections. As for he backup comments above, I’ve known some pros who use two Raid 5 systems — one local, and one remote. Yes, that’s a really sensible system, especially for pros who are dealing with large volumes. Good advice. I keep my photos on an external drive and make a second copy to another drive at the same time. I also used time machine to back up everything on two additional drives. It may seem like overkill, but I’m fairly confident that I won’t lose anything because of drive failure. It seemed like a real faff doing this at the start, but I don’t notice it now. You can never have too many backups! I’m glad you’ve found a system that’s working well for you. I now see your old post. I have a Mac time machine too, but only use as a back up of the ssd on my laptop. you gave me an idea – to let time machine take back up of my second drive. Is that simple?? I think; is it just to put an extra hd to the time machine usb port?? if something happens to my second drive would it be possible easily to use the back up for restoring the lightroom folders??? I’m a big believer in the 3-2-1 workflow for backup. Store it in 3 places. In my case my 400k+ images sit on an external drive attached to my mac. That drive is backed up with all my other drives using Time Machine to another external drive. Automatically my drive is cloaned using Carbon Copy Cloner to another drive, and then all of my data including images are backed up to the cloud using BackBlaze (unlimited backup for $5/month). I live where we have had to evacuate our home multiple times because of fires. Usually I haven’t been home when that happened so those back drives are labeled with big labels saying TAKE ME so my wife can grab them if needed and if she doesn’t and I lose them the cloud back takes care of that. I also use drive software that monitors my drives so I can catch a drive failure before it happens. One last bit of news BackBlaze issues a report each year on the drive failures they see for their thousands of drives. It is a real good way to see which specific models of drives are reliable. I just setup two NAS on my network. Those NAS shows up under “Network” in Windows 10. I decided to upload some photos to the NAS, no problem. Then I started LR 5.7 to see if I can connect to the NAS and edit those photos. The NAS and its drives didn’t appear on the “Import Photos and Video” listing in LR5. Looking at a few comments made on the Internet back in 2014 – 2015 many users of LR were having the same problem without a clear solution. Then it occurred to me, when I was in IT, that you can Map a Network drive. This procedure places the mapped drive under “This PC” drive listing. It worked. I hope this solution will help others with the same problem. Thanks for teaching me “the right stuff”. There isn’t a “correct” location for exported photos, as it’ll depend on why you need them. In most cases, exports are temporary (for a specific purpose, such as sending to an online lab) rather than needing to remain there permanently… since if you need the exported photos again, you can just export them again. I always advise our participants to come up with a storage plan and organization that makes sense for them, write it down, and never stray from it, whether in naming conventions for folders or files, or applying copyright presets, etc. As Victoria says, you must always do things from within Lightroom so the program knows where your images are, how you have reorganized and/or renamed folders, etc. Personally, because we travel so much, I store my images on an external 4TB hard drive along with my LR catalog. On the road, it gets plugged into my laptop, at home, into my home computer. On the road, I carry another 4TB hard drive for backup, and I can also backup those travel files into my computer for safety. I wrote a blog called Backup, Backup, Backup, and in it, I advise backing up in what I call “multuplicate”. Everything of mine, images and documents, is backed up at least five times, two of which are rotated in and out of our safety deposit box. Also, I advise in backing up to external HDs if that is your method, to not buy them all at once, the theory being that when one fails, the others in that job lot will fail to. It is never a question of if a computer or HD will fail, rather when. Victoria is fabulous in her advice and knowledge and is a great asset to all photographers. Very good thinking, avoiding the same batch of hard drives. Thank you for this! So helpful! So, my photos are a mess- I moved some off my laptop and now Lightroom can’t find them. If I move them back to the pictures folder, will that fix the problem? Second question: I actually need to move all photos onto an external drive- running out of room on the laptop. How do you tell Lightroom where to find these? How should I store/import my photos if I wish to work on part of the photos in my local drive ( because it’s faster) and leave the rest of the photos in an external hard drive? After the work is done, I can still keep the newly edited photos in the same external hard drive? THANK YOU!!! I am new to lightroom and also new to storing my photos on an external hard drive. For the last three weeks I”ve been taking various courses online. But for the LIFE OF ME, I could not figure out WHY the photos on my external were getting moved back to my laptop’s hard drive. Until YOU wrote this beautiful statement to which now I COMPLETELY understand what was happening! “At the top of the dialog, you’re given three main choices: will you copy the photos to a new location, move them to a new location or just add links to the catalog, leaving the image files where they are.” So just a huge thank you for simply explaining this!!!! I’m glad it helped Amy! Make sure you pick up my free Quick Start eBook to avoid other potential pitfalls too. Will do! 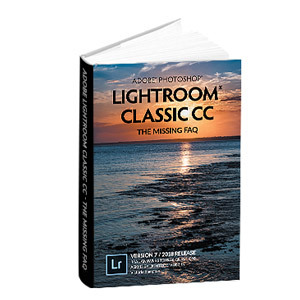 Thank you again, you truly are the Lightroom Queen! I am in the process of cleaning up the mess I created across the past decade. I am looking at the 6 hard drives that I can still read that contain my library of photos that were haphazardly stored — some here some there. I will be sorting through these allowing Lightroom to detect duplicates. I will be storing these on a NAS which willl be my primary photo library. I have used a standard file naming strategy that allows Lightroom to create and organize the folders by date. This also helps me identify any dups that LR misses. While moving these to my NAS (RAID 5), I will be backing them up on two standalone 5 TB hard drives; these will be swapped out — one will be stored offsite and one will be in my work area, but for starters I will be creating the seminal library on both external drives. It has helped me think this through just writing it here. I would appreciate your comments on these plans — Does it appear that I have covered the bases in terms of storing my primary LR photo library and the back-ups of the same? A friend reports having good success working with a NAS (RAID 5) for her LR library — your thoughts on this? I will have a much larger library and will work more intensively than I believe she does. I don’t want to get into this and find some unhappy surprise! That sounds good Martha, just make sure you back up your Lightroom catalog to more than one location, as well as the photos themselves. NAS can work well for photo storage, but just bear in mind the connection speed might be a bit slower than directly connected storage. One thing that can help is generating smart previews, which are stored next to the catalog, and checking the “prefer smart previews for editing” checkbox in Preferences > Performance. This loads the smart preview from your local hard drive (much quicker) and then only loads the original from the NAS when it needs the full size. Any suggestions for a 4 or 5 Tb Thunderbolt /USB portable hard drive. I’m on a Macbook Pro, mid 2014 with Thunderbolt 2 ports. I use Lightroom to process pictures. I use the hard drive for storage of photos. I’m running out of room on a Seagate 2Tb. Thank you. I’ve been using the Western Digital My Book one for a few years, although mine is just USB3, not Thunderbolt. Thanks for this and many other useful articles. While keeping the untouched originals in the “Lightroom way”, saving edits in the catalog. But I also want all the photos in a final jpg-version, in an identical folder hierarchy, so that the files are being synchronized automatically after any edits I may make on the originals within Lightroom. If no edits made, the photo should just be replicated without edits as jpg Ib the final version folder. It’s this possible? I’ve been thinking a lot about this and using the export function is simply not an option. It would become a mess, and a lot of manual work. It would be impossible to keep the originals and the final pics in sync. It’s kind of possible with Publish Services and some manual setup of the collections, but it’s a lot of work for basically no benefit. What are you hoping to accomplish by having this additional folder structure? I have a catalog/storage/back-up issue that your knowledge would be helpful in figuring out. I would look at network accessible storage (e.g. Synology) to hold the photos, which could be a striped RAID for speed (it’s not backup). Back that up to your existing hard drives, and perhaps to additional drives in the NAS. And then, if the users are each going to have their own catalogs, make them promise not to move any of the files because it would break the links in the other people’s catalogs. Bear in mind that there’s no easy way to share a master catalog with multiple users through Lightroom, and the catalogs have to be stored on the user’s own local drives.